The Syriza Party has come out victorious in the Greek parliamentary elections on Sunday, the result of which could spell disaster for Greece and Europe as the party promises unrealistic goals that it hopes will completely ensure the recovery of the economy. When the globalized Great Recession hit Europe in 2008, the first country that went bankrupt was Greece. It was also the first country to receive bailouts from European Commission, European Central Bank, and International Monetary Fund, the Troika. 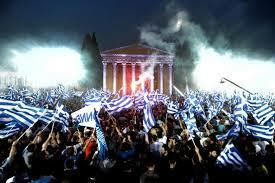 The Troika had placed certain conditions along with this bailout that was meant get Greece’s economy back on track. It implemented many austerity measures that aimed at balancing the country’s high deficit. The privatization of government assets aimed at maintaining the debt at the same level as when the country entered this recession. And finally certain reforms were implemented that were and still are expected to raise the country GDP. Ultimately, these measures failed to help recover the Greece’s economy. Many Greeks now live at poverty levels with the unemployment rate reaching to 26%. The GDP growth has not increased significantly in recent months. The slow growth of the economy prompted Greece’s to seek two more bailouts. Today, the country owes 360 billion euros to its loaners and that includes private and public loans. Fed up with all the sanctions placed on the country and producing no effective results, Greeks saw hope in Syriza party which ran on the platform of reversing many austerity measures, prompting the Troika to forgive the loans and promising a recovery of economy without Europe’s help. Once in power, the party wants to undo all the austerity measures, starting with increasing wages of employees who saw their earnings slashed at the beginning of the financial crisis, providing free electricity and food subsidies for families with no income, and placing a property tax just on the rich rather than all people. The biggest concern of all resulting from this election is whether Greece will replace its euro currency with a new individual one. The euro currency was adopted by Europe to help keep inflation stable and therefore the economy stable as well, but since the Syriza party believes that Greece’s economy can stand on its own with at least the federal budget being balanced now, the possibility of the country adopting a new currency is real and dangerous. It has been projected as being disastrous for Greece’s economy and there are doubts whether it can recover its competitiveness on a global scale. With the election’s results just two weeks old, it is still hard to project what the future holds for Greece. The hardest part that Greece has to endure is if the lenders deny Greece’s request for writing off their debts so it can have clean start.